Floral Arrangements: Teleflora and Proflowers are both reputable. The best part is that you can find beautiful options for around $20. Work-out Gear: We all know that right after Christmas comes New Years and the resolve to exercise. My fitness friend Adrian Jessen shares some great ideas on her Better Choices. Better Living blog. Check it out! I did and it gave me a much needed idea for my college daughter. Homemade cocoa stored in a decorated mason jar is simple, sweet and easy to do last minute! Here’s the recipe: Swiss Miss DoAhead Style. Unique gift ideas for men are yours if you click on this link from Amazon. 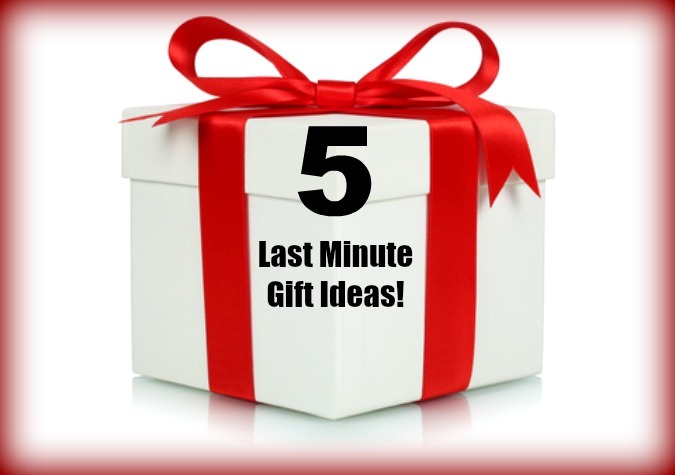 My quick perusal revealed a variety of affordable, fun ideas (stocking caps, grill accessories, sports paraphernalia to name a few). The fifth and final last minute idea? How about the gift of your sweet ol’ self? Most of your friends and family would be delighted to have the most precious of gifts and that is the gift of your time. A note with a card listing three reasons why you would love to take them for coffee will probably go on record as one of their all time fav’s. That’s it friends! I’m off and and running. No elves here. I’m guessing you’re shy on them at your place too. Good luck and God speed! You and me both!! Let’s grab our cups!